Unless the completed ballot papers supporting PDAU recognition (i.e. voting “YES”), received by the QIP by Noon on Monday 11 March, are 40% or more of those eligible to vote nothing will change and pharmacists will be blocked from trying again for a further three years. If you consider that you are eligible to vote and have not received a ballot paper by 22 February 2019, or if you do not think that you are eligible to vote , but receive a ballot paper, please contact the CAC Case Manager, Linda Lehan, by email at llehan@cac.gov.uk giving your full name and address. If you have recently changed your address and you have not informed your employer you should do so as soon as possible to ensure you receive your ballot paper on time. Mark Pitt, Assistant General Secretary of PDA Union explained: “We want maximum participation in this ballot, so we have communicated comprehensively to those eligible to vote and made ourselves available to answer their questions. 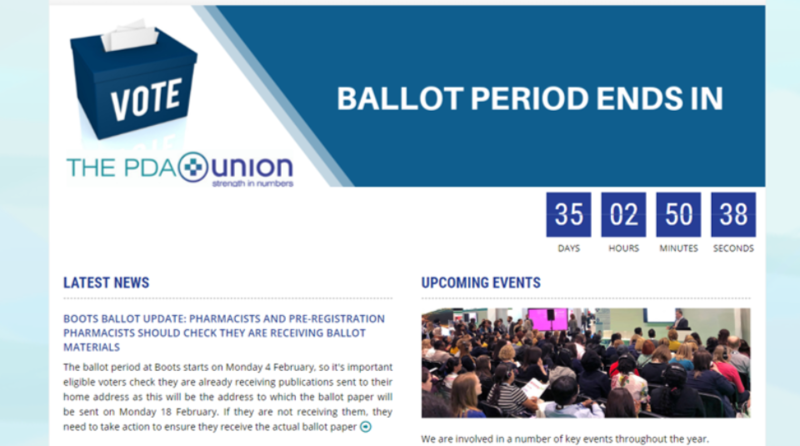 Pharmacists and pre-registration pharmacists at grade 5, 6 & 7 in Boots stores will be entitled to vote and ballot papers will be sent to their home addresses from Kanto Elect by post on Monday 18 February.